For about fifteen years, it is now common to say that photojournalism faces a crisis. It is indeed becoming more and more difficult for professionnal photographers to get the material resources to practice their job. The economic crisis in the press sector and the development of digital publishing have undermined the economic model of the field. The vanishing of photos agencies that used to make France one of the biggest places of photojournalism gives evidence of this observation. The topic rises quite a lot of questions, but few solutions in perspective. The festival aims at contributing to bring answers. 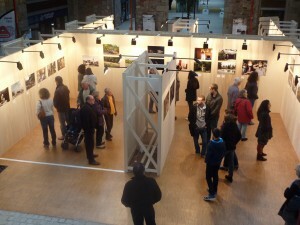 Saint-Brieuc Agglomération, at the origin of the project, enables the initiation and structuring of the festival. But the project is based on private funds. The production of reports is indeed totally financed by funds from the private sector. An endowment has been settled, to collect financial support through sponsorship. The financial partners then do not have any scrutiny on the editorial line. No specific theme was required for the selection, in order to leave the photographers the highest level of freedom in the choice of their proposals. The festival aims at showing the world in its diversity. For this second edition, about 300 photographers applied from 46 countries. For the first edition, the call for projects generated more than 300 applications from 40 countries, from India to Georgia. The jury selection of photojournalists, without any ethnic criteria, is almost half composed by foreign photographers.